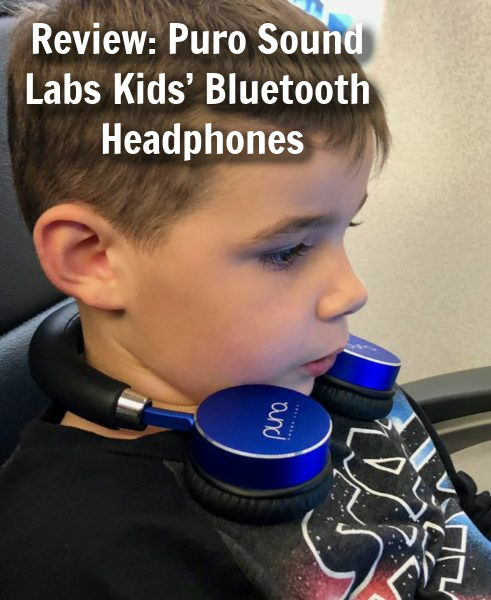 Puro Sound Labs BT2200 Volume Limited Kids’ Bluetooth Headphones might just be the holy grail of kids bluetooth headphones, or non-bluetooth for that matter. 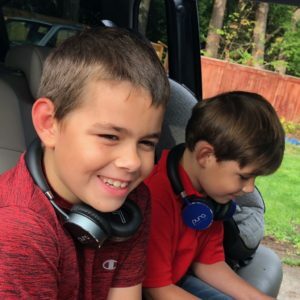 I knew I needed new earphones for my kids the first time my son complained he couldn’t hear a thing out of his Spider-Man set and was asking to use my earbuds, which I knew couldn’t be good. 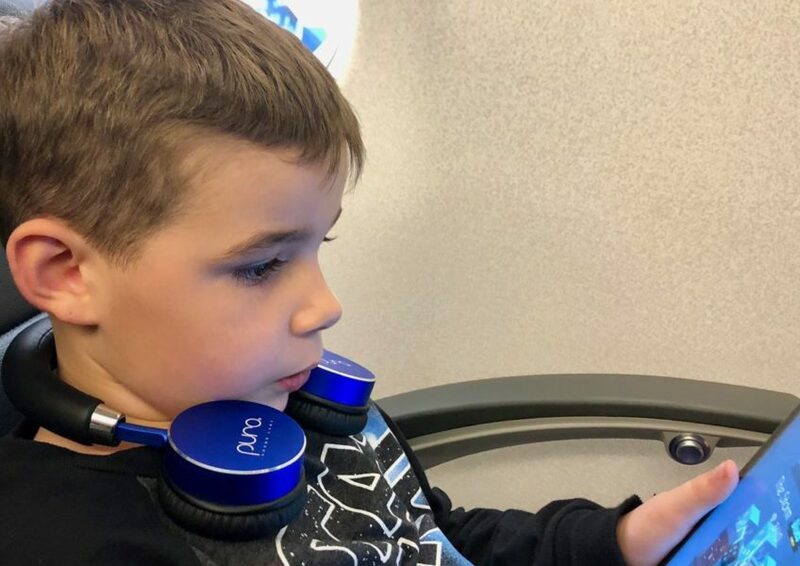 Kids need volume limited headphones to keep them from blasting their little ear drums, but they also need to be to able to hear their movies on the airplane and in the car. It’s a dilemma for traveling families. In the car, on the plane, on the train…these headphones are great in all modes of transport. Thank goodness for Puro Sound Labs, which set out to solve this problem. Their earphones have a volume limit of 85 decibels, which is the recommended limit for children, but they also block out 82% of background noise with their over-ear design. This means that on our recent flight, I could hear the annoying soundtrack to the Angry Birds game my son was playing on the iPad just fine when I stole the earphones from him. They blocked out the engine roar that well. I did briefly check music and movies, and they were easy to hear, too; he just happened to be on an Angry Birds kick on our test flight. This is an important issue for me personally, because I have tinnitus (occasional ringing in my ears) in one ear. I grew up all over the world, moving every few years, which means I spent a lot of time in airplanes with earbuds in and the volume turned all the way up, straining to hear the soundtrack to whatever movie was playing on the plane at the time. This likely caused my tinnitus. I now fly frequently with my own children, and I really don’t want them to have any similar issues. That’s why I appreciate the story behind Puro Sound Labs so much. When the founder’s daughter was diagnosed with noise-induced hearing loss, likely caused by the earphones she was listening to on the way to school every day, he set out to create earphones that would limit the volume to appropriate levels for kids and help fight the epidemic of noise-induced hearing loss. 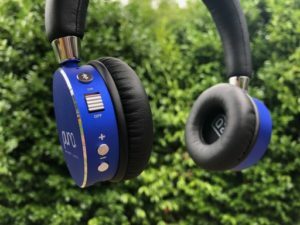 The BT2200 Volume Limited Kids Bluetooth Headphones are beautifully designed; the manufacturer has clearly set out to create an object of such quality that your kid won’t ask for his hearing-damaging earbuds back. The headphones have nice padding over the headrest and over-ear portions. They are adjustable, and fit well on all three of my boys ages 3, 6 and 9 without any slipping or need for adjusting. The left and right sides are clearly marked with L and R, which I really appreciated. I’ve never had Bluetooth headphones for my kids before, but now I can’t live without them. No more cords to deal with, and now it’s dance party central over here. They also have an impressive 18 hours of battery playback, which is plenty of time for any flight or car ride. The headphones are beautifully designed and the buttons were pretty easy to use for little fingers. I don’t usually let my kids own anything of this quality or value, to be honest. I was a little nervous the first time I let them take these on a trip. However, the case they come is very sturdy, and the headphones themselves are well designed so that the case, while inherently bulkier than, say, a pair of earbuds, is as streamlined as possible. The earphones swivel to lie flat and fit in a hard clamshell case that zippers shut. Long story short, these will be our go-to earphones forever. They are comfortable for all three of my kids — no complaints, and trust me, I have complainers. The Puro Sound Labs BT2200 is a winner. Disclaimer: I received this product for free from the company for review purposes, but all opinions are my own.